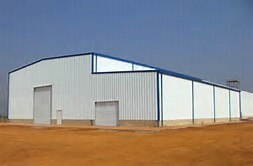 There are many reasons why the modern homeowner might become interested in steel buildings. Like lower to foundation bearing capacity requirement, environmental pollution caused by the construction is small, and light steel building components used standardized production factory. Today we will let you know the knowledge about the steel column, because it also play an important role in steel construction. Steel columns, also called steel posts, are used to support ceilings so that they do not cave in. If your original supporting posts, such as brick lally columns, start to disintegrate, it's time to start installing new, steel columns. Usually the steel columns you can purchase from home appliance stores are 8 feet tall and have an adjustable screw top you can raise up and down to fit the area between your floor and ceiling. Steel structure building is not only the carrying capacity of engineering considerations but also consider the ecological carrying capacity. It can not only meet the various needs of building function, but also can effectively handle the dialectical relationship between the good building energy conservation, material saving and Protect environment can realize the efficient use of resources and recycling targets.